Posted on October 29, 2010 by Jill B. With the rise of flash technology, digital storage is continually growing in capacity while shrinking in physical size. When it comes to USB flash drives, this concept leaves countless choices for design options and daily functions while opening the door to an affordable custom flash drive market. To help you navigate through your choices, we’ve come up with a basic 101 on custom USB drives. By understanding what they are, how they can be used and the styles offered, you’ll not only be closer to finding what you want, but also understand how custom flash drives can benefit you. So what are custom shaped flash drives? The short answer is that they are whatever you want them to be. The longer answer is that they consist of the basic working skeleton of a flash drive, except that the casing that fits over the drive is crafted from a customizable material like rubber, metal, plastic or wood that can be molded into a specific shape. 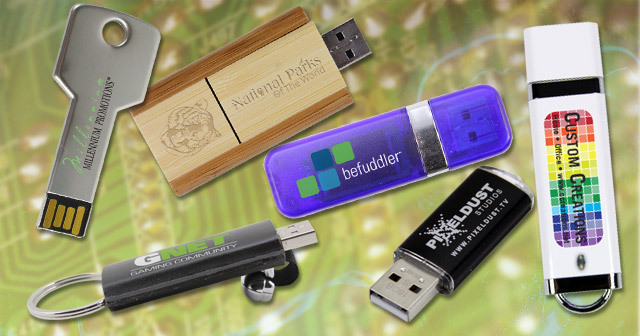 Rubber is ideal for USB drives that are shaped like food items, cars, landmarks or anything requiring fine detail. Plastic shaped drives will accommodate similar items as rubber, although there may be shape limitations since it has less pliability. Plastic still provides ample creativity. You can create everything from flash drive surfboards to syringes, screws, calculators, footballs, basketballs and hearts. Wooden USB drives are for designs that demand an earthy, rustic look. Logos can be easily carved into wood. Metal is suited for USB drives that require a similar material in their real-life counterparts. Ideas like dog-tags, jewelry, bullets and soda cans demonstrate this similarity. Printing also enhances custom USB drives. When you want to use a standard casing for your drive, but still want a personal touch, printable flash drives can display a range of logos and artwork. Silkscreening and 4-color printing will layer colors of ink onto the drives with help from stencils or printing presses. Laser engraving, stamping and embossing all use machinery techniques rather than ink to etch or imprint designs onto drives. You will need to match the appropriate technique with the right flash drive case material in order to achieve a lasting look. Custom USB flash drives can be used in a variety of settings, be it for business or personal data storage. However, where their function really shines is for marketing purposes. A company or organization has great potential to boost brand exposure with a promotional USB flash drive. Your target audience will love them because they can be used for work, school or entertainment to store pictures, documents, videos and more. Since USB flash drives are an integral part of how we use PCs and Macs, they are desired commodities that pack a lot of value. The devices also give what you’re promoting greater visibility. They will think of or see the brand or company logo every time they need to use the drive. If the drive has a novelty shape, it could also spark the attention of surrounding people. The combination of their practicality, value and visibility work together to create an overall positive impression of your brand or company in the eyes of your target audience. How would you use a custom USB flash drive? Think of a wacky shaped drive you’ve seen or one you’ve dreamed up and tell us about it! This entry was posted in Articles, Custom USB Flash Drives, Flash Drive, USB Flash Drives and tagged custom flash drives, custom shaped flash drives, custom USB drives, Custom USB flash drives, metal USB drives, printable flash drives, promotional USB flash drive, USB flash drives, wooden USB drives. Bookmark the permalink.